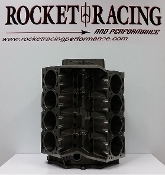 ROCKET RACING HAS FIXED ALL OF YOUR INHERENT PROBLEMS OF THE OEM OLDS BLOCK. WE HAVE INCORPORATED STRONGER MAIN WEBS, THICKER OIL PAN RAILS, ARP HARDWARE, TRUE PRIORITY MAIN OILING AND UNIVERSAL BELLHOUSING THAT ACCEPTS OLDS, BUICK, PONTIAC, CADILLAC, AND CHEVY. OILING MODIFICATIONS, GIRDLES ETC ARE NO LONGER NEEDED. THESE BLOCKS WERE DESIGNED BY OLDS SPECIALISTS, MACHINISTS, AND RACERS UTILIZING THE LATEST CAD SOFTWARE TECHNOLOGY. THEY ARE MACHINED ON STATE OF THE ART CNC MACHINES OPERATED BY THE MOST SKILLFUL AND TALENTED MACHINISTS IN THE COUNTRY. WE ALSO WANT TO SAY THANK YOU TO ALL OF OUR CUSTOMERS FOR THEIR CONTINUED LOYALTY TO US WHICH HAS KEPT OUR DRIVE GOING TO BRING TO THE MARKET THE LATEST AND GREATEST OLDSMOBILE PRODUCTS. WITHOUT YOUR SUPPORT NON OF THIS WOULD BE POSSIBLE!! SHIPS TRUCK FREIGHT COLLECT. CALL FOR QUOTE!! CUBIC INCH DIS: VARIABLE DEPENDING ON BORE(UP TO 4.400”) AND STROKE( BLOCK IS CLEARANCED FOR 4.5” STROKE, MORE STROKE CAN BE ACHIEVED WITH ADDITIONAL CLEARANCING). WHEN REMOVING MAIN CAPS INITIALLY , CAPS AND BLOCK SHOULD BE DEBURRED BEFORE REINSTALLING, THIS WILL INSURE THAT CORRECT MAIN SIZE IS MAINTAINED. CAM PLUG, OIL GALLERY PLUGS INCLUDED...SEE KIT. ALL OTHER OLDS FLAT TAPPET AND HYDRAULIC ROLLER LIFTERS WILL WORK. OIL IS DIRECTED TO THE MAIN BEARINGS BY UTILIZING A STEPPED MAIN PRIORITY OILING SYSTEM. THIS ASSURESALL MAINS ARE EVENLY FED. SPECIAL NOTE: WITH A MULTITUDE OF DIFFERENT CRANK, ROD AND PISTON COMBINATIONS AVAILABLE IT IS IMPORTANT TO CHECK CLEARANCE OF ALL MOVING PARTS, ESPECIALLY CRANKSHAFT COUNTER WEIGHT AND CONNECTING RODS TO BLOCK. ALL PARTS MUST BE CHECKED BEFORE ANY MACHINING OR ASSEMBLY IS ATTEMPTED.